Flexibility, efficiency, and innovation have propelled the SABERjet™ CNC SawJet to a leading sawjet machine in the stone industry. 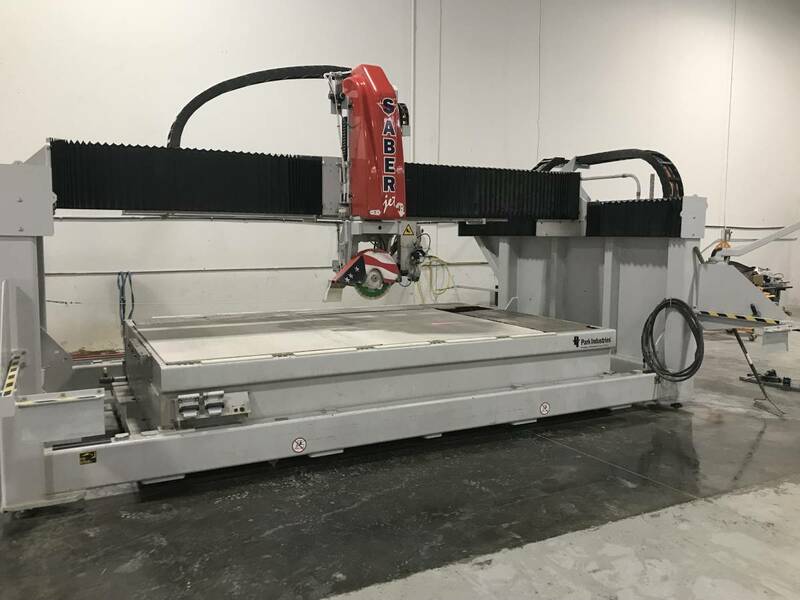 Built off of the success and compact design of the SABER™ 5-Axis CNC Saw, the SABERjet takes a leap forward in productivity with the addition of its precision waterjet system. 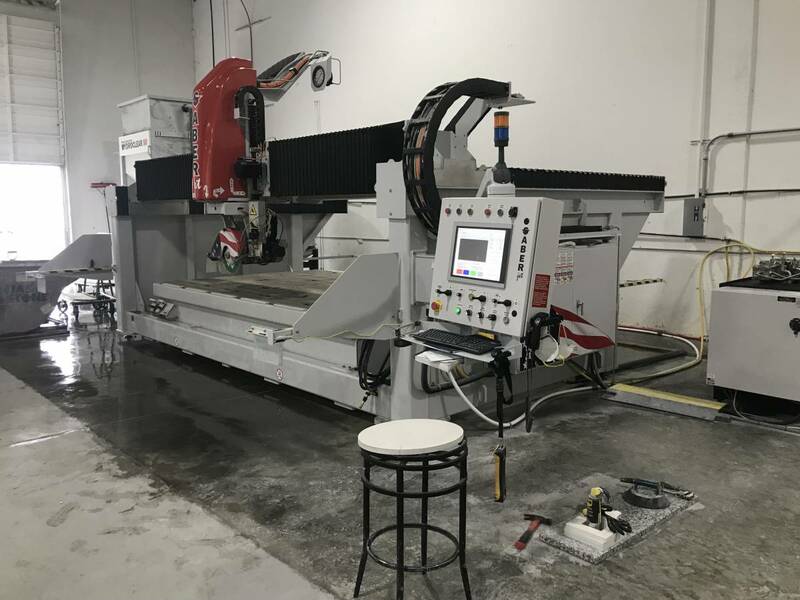 The energy efficiency of this CNC sawjet is like no other, greatly decreasing fabricator’s utility costs with less inrush power consumption. 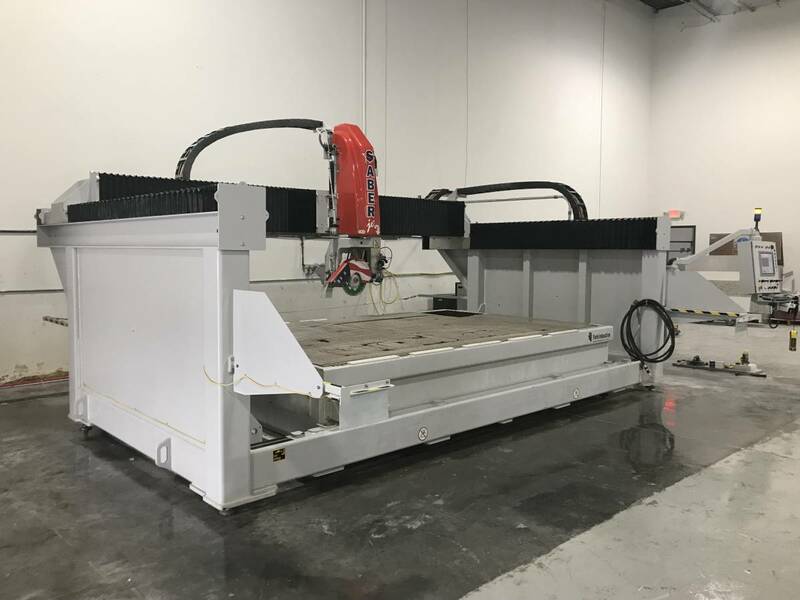 By adding a precision waterjet to pair with its already fierce blade cutting capabilities – nesting parts, radius cuts, and inside corner cuts have become even faster. What truly separates the SABERjet from other sawjets is its MiterJet capabilities for inside mitered cuts. 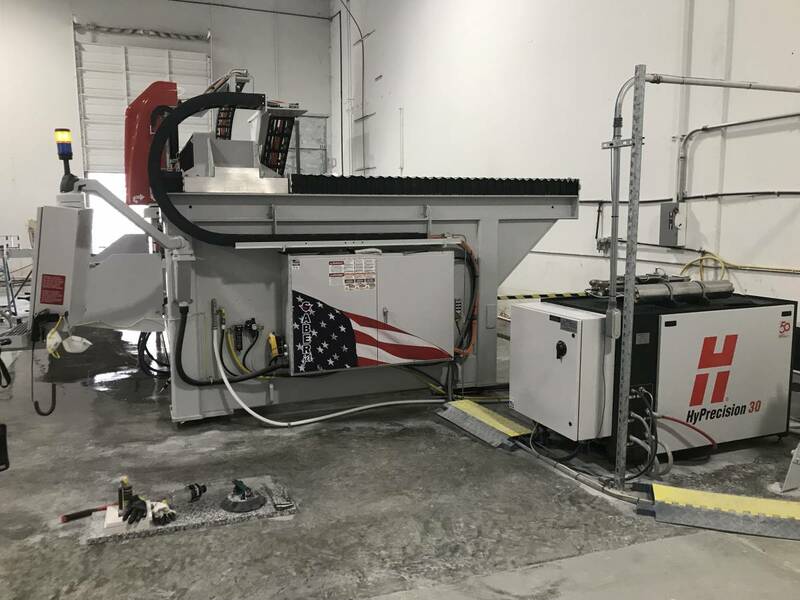 With one of the largest mitering work envelopes in the stone industry – up to 7’x12′ slab coverage – the SABERjet CNC SawJet is the mitering sawjet of choice. Reach any miter with its precision mitering blade, or MiterJet inside miter cuts with the sawjet’s mitering waterjet (optional upgrade). The accuracy of the blade or jet produces flawless miter cuts allowing for tightly nested, clean, accurate parts. The small footprint, single-pick, monoblock design of the SABERjet CNC SawJet is ideal. It is a true monoblock designwith no bolt-on extensions resulting in extreme rigidity. 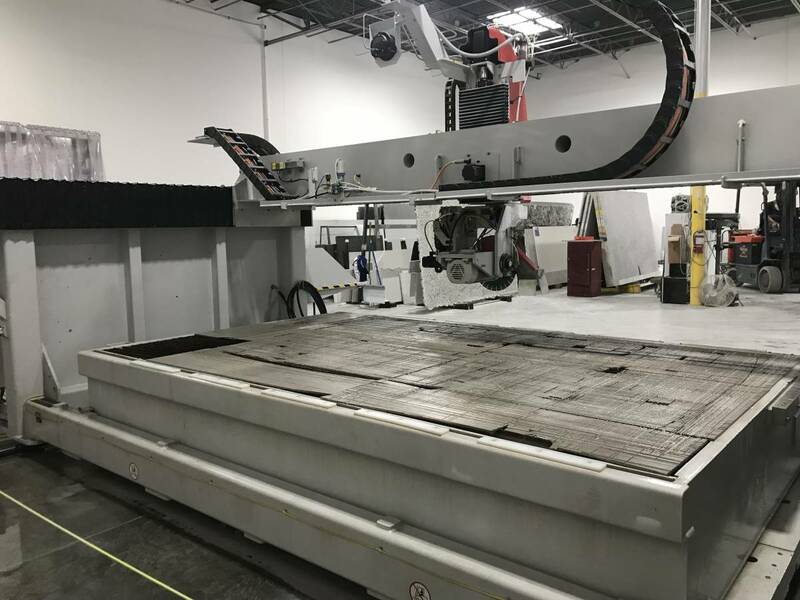 The compact sawjet machine design requires minimal floor space and offers a low ceiling height requirement – only 11 feet due to the no whip waterjet design. The 1500 lb capacity, patent pending Slab Loader has a hydraulic powered tilt table allowing for safe, efficient loading of slabs, including fragile exotic stones or materials. Advanced CNC SawJet capabilities meet operator-friendly controls to provide stone cutting flexibility. The SABERjet’s optional VFD (Variable Frequency Drive) increases the saw’s efficiency when cutting ultra-compact surfaces and materials. This VFD option operates at a range of 1500-2500 RPM. The SABERjet’s laser line positioning is a visual guide that allows operators to position the cut path with confidence in its orthogonal cutting mode. Orthogonal cutting mode allows the machine’s blade to cut manually in any direction at any desired angle. The complexity of this cutting style is made easy by allowing simple manual cuts without generating a program. 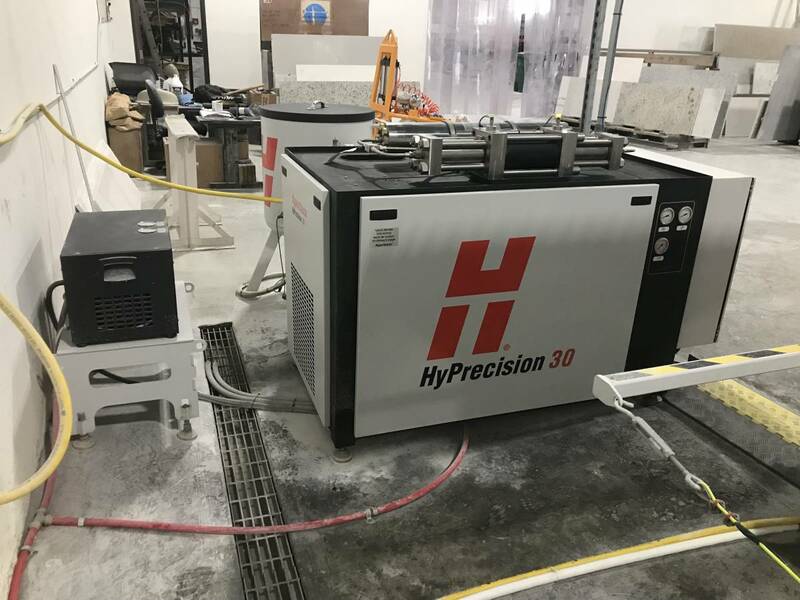 The SABERjet CNC SawJet utilizes a Hypertherm® HyPrecision 60,000 PSI Waterjet, one of the lowest cost of ownership waterjet systems in the stone industry. It has a built in standard motor soft start for the waterjet pump that requires less InRush electrical current which can dramatically reduces your electrical bill. The efficient pump also requires lower energy consumption during waterjet cutting while Hypertherm’s booster pump maintains consistent water supply line pressure to the waterjet pump. Minimal Height Requirements – 11 Ft.